awards Presented to tinmangallery .
. The Jeff Hobrath Art Studio Web Award . Presented to: Keith O'Connor "For excellence in web presence" Graphic design - Your site is eye pleasing, and a joy to browse around in? Content - Your site is a learning experience, a positive influence, and a great contrabution to the web. Artistic flare - Your site has artistic flow and well worth the extra loading time? Originality - Your site stands out as one of a kind? Your art and site wins our award hands down. Keith your website has given us much pleasure during the evaluation process and we were impressed with the standard of quality you provided for viewing. We are fully aware that much time and effort went into the creation of your website and we hope that you view this Award as a reflection of your achievement. Keith your site is well designed; easy to navagate and demonstraits excellence in original artistic content related to the academic areas of : philosophy, psychology, history and metaphysics. I am not always impressed with the work of people who say they are artists. So I found your site to be a wonderful relief!! I especially loved the sculptures --though all your art is very expressive, emotional, and even archetypal, your sculptures seem to be especially so. Keith, I am pleased to tell you that your site does indeed qualify for my "Higher Mind Award"! entertaining, presented well; easy to access. Keith, I had a great visit to your website. I loved your drawings. Being an "artist" myself, I love to look at others artwork, displayed with pride and confidence. 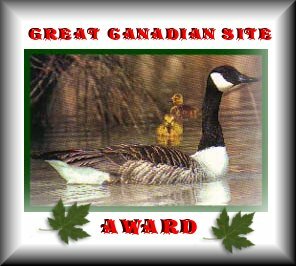 I am extremely proud to present you with the Great Canadian Site Award.